Derek and I are hosting our first Easter in our home since we got married. I wanted a wreath to hang on the front door to welcome our guests but I couldn't find one I liked without a heavy price tag. With a Hobby Lobby gift card in hand a turned to Pinterest. 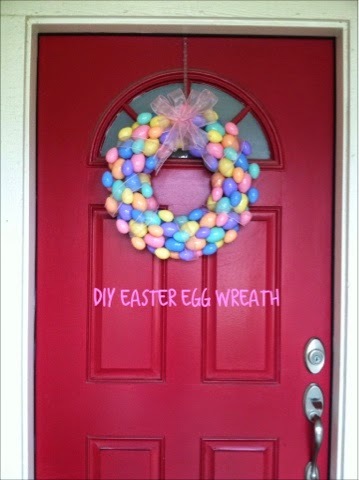 This cute, easy to make, Easter wreath caught my eye. 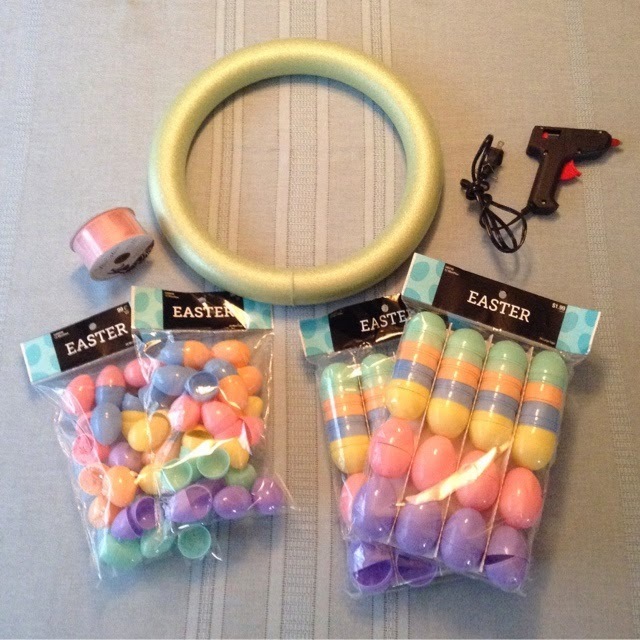 Bonus: Easter items are 40% off at Hobby Lobby right now. 3 bags of regular size Easter eggs. ($1.99 each) Only 2 bags pictured. 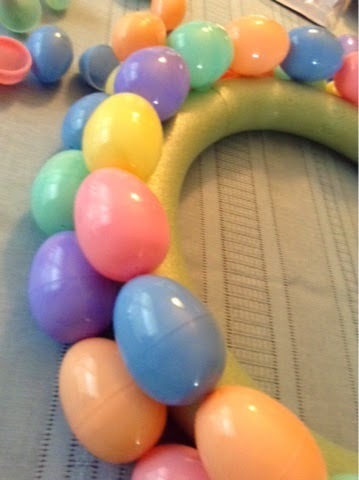 I started by laying the eggs out around the foam ring to come up with a simple pattern. Once I had a pattern in mind I glued the eggs down one row at a time. If you make a mistake don't panic! The eggs are pretty easy to pull off. Just be sure to peal off the old glue before adding more to replace the egg. 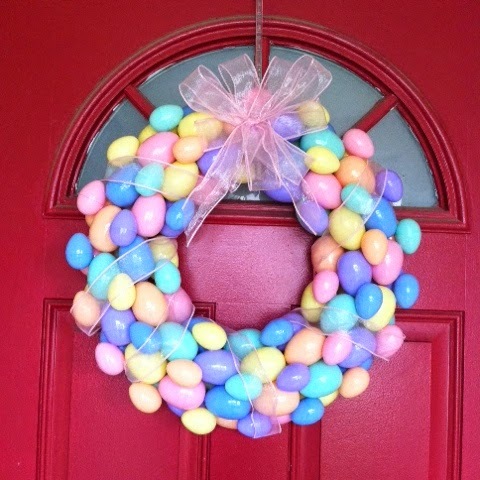 I used the small eggs to fill in the "holes" in between the bigger eggs until the whole wreath was full with eggs. I then rapped a ribbon around the wreath and glued the ends to the back. I created a bow with the left over ribbon and glued it to the top. You could always buy a ribbon premade, Hobby Lobby has a good section of them. I hope you enjoy making this wreath as much as I did! A few days ago I noticed some over ripe bananas at my office. Knowing no one was going to eat them I put them in a bag and took them home to make banana bread. 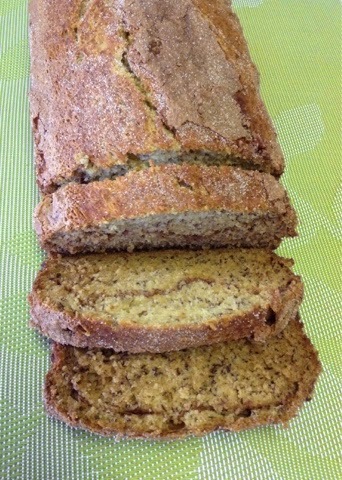 I didn't want to make normal, same-old-same-old, banana bread so I searched for some different styles on Pinterest. I came across a cinnamon swirl recipe and adjusted it a little bit. I made the bread that night and brought it to work the next day for breakfast. My coworkers loved it!